Educating an audience. Did you know crown moulding delivers 174.1% ROI for homeowners? If you had visited a trade show at which Metrie exhibited, you certainly would. Metrie tapped Evoke Idea Group to complement their existing trade show displays with a pop-up banner that could educate audiences. With a single, powerful statistic, the banner was an eye-catcher and conversation starter for the Metrie team working their tradeshow events. 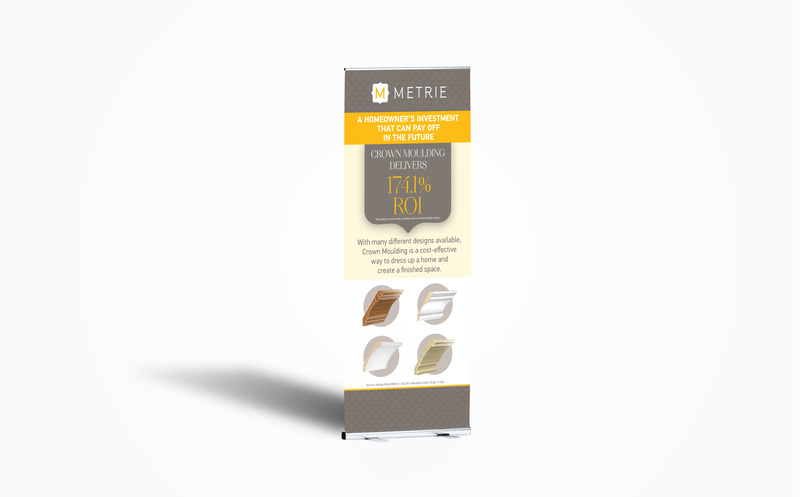 The smaller pop-up format of the banner meant that Metrie could take it to even the smallest of events and still make a big impact – or could use the banner in conjunction with their display booth to build on their existing messaging and branding.